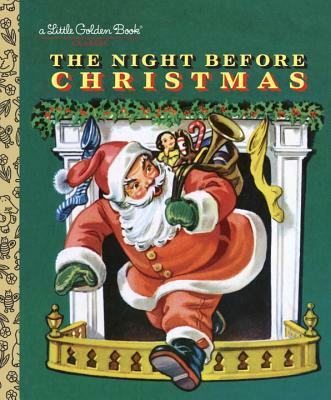 Reintroduce children to America's favorite Christmas poem, "The Night Before Christmas," with this recovered Little Golden Book adaption. Recently found in the Golden Books archives, Corinne Malvern's artwork for this book has been beautifully restored for today's kids! Clement C. Moore, who taught Biblical history in New York City, wrote this Christmas favorite in 1822 for his own children. He later published it as A VISIT FROM ST. NICHOLAS. Corinne Malvern (1901–1956) was a commercial artist who made her mark in fashion advertising and children’s books. She was an art editor of Ladies’ Home Journal, and often painted its magazine covers. She illustrated many iconic Little Golden Books, including A Day at the Seashore, Heidi, The Night Before Christmas, Doctor Dan the Bandage Man, Christmas Carols, and Nurse Nancy. "Children will enjoy the humorous details. A popular choice." --Booklist.